Nearly 10 years into the life of Bistro du Midi, the quintessential Back Bay bistro is making some big changes. Himmel Hospitality Group announced today it has taken over all day-to-day operations, and has welcomed back opening chef Robert Sisca as a partner. Bistro du Midi also introduced a more approachable first-floor dinner menu, among other changes. Several changes are visible now at Bistro du Midi, including new, commissioned artwork and other restaurant décor; lunch reservations; and lunch service in the iconic, second-floor dining room that overlooks the Public Garden (the mid-day meal has been a walk-in, first-floor-only affair). Sisca returned to Bistro du Midi about two weeks ago, and his menus drop today. He’ll serve a daily crudo tasting during dinner, and also has a chef’s whim-style tasting menu with five-and seven-course options. Some new dishes include cauliflower tartare; house-made black pepper chitarra pasta with local lobster, grapefruit, and vanilla; and black sea bass with shiitake mushrooms and bok choy. 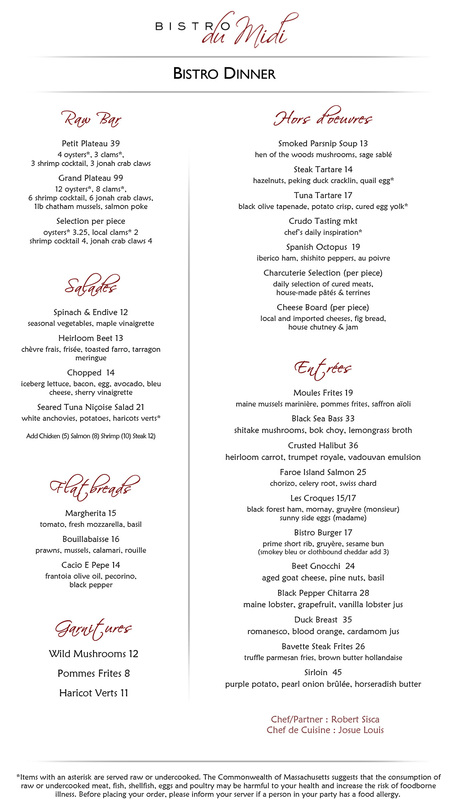 For lunch and first-floor dinner service, Sisca has a new “bistro dinner” menu, a more casual set of offerings from classic dishes like moules frites; Spanish octopus; and a seared Niçoise salad; to creative flatbreads and more. Check it out below. A Johnson & Wales graduate who was sous chef at Le Bernadin when it earned its third Michelin Star and four stars from the New York Times, Sisca was at the helm of Bistro du Midi when it first opened. 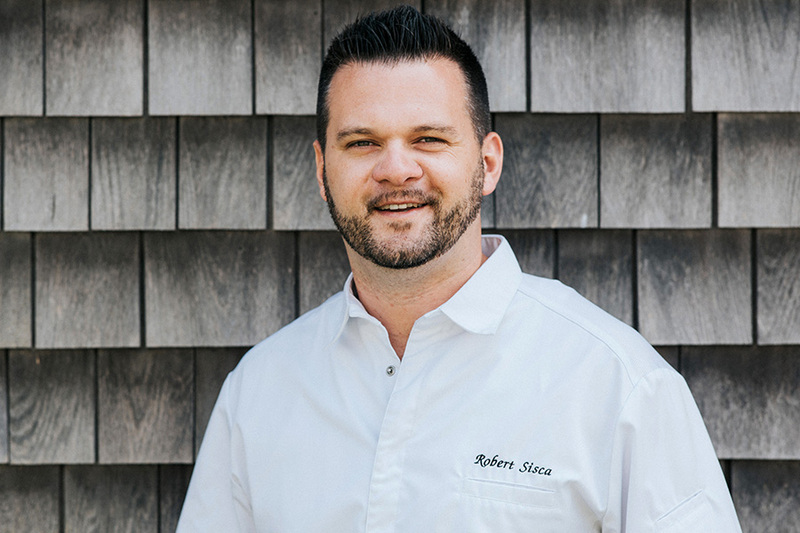 He was the 2011 Best of Boston Chef, and was twice-nominated as a Food & Wine Best New Chef. Sisca left Boston in 2016 to join Rhode Island-based G Hospitality Group to open Garde East on Martha’s Vineyard. There, he continued to develop good relationships with New England seafood purveyors, per today’s release. Sisca’s mentee, Josue Louis, took over at Bistro du Midi. The younger chef will continue on as chef de cuisine, while Sisca’s new title is executive chef and partner. Bistro du Midi also has a new general manager, Federico Salvador. An industry veteran, Salvador was most recently service director at L’Espalier; and general manager at the Michelin-starred restaurant A Voce in New York City. With the formal takeover, Himmel Hospitality’s resources are now available to Bistro du Midi—and that means a revamped beverage list overseen by master sommelier Brahm Callahan. At Grill 23, Callahan’s wine program is James Beard Award-nominated, and is also among the world’s 89 Wine Spectator Grand Award winners. One thing that will not change at the revamped Bistro du Midi? Seasonal Boston Public Garden-side patio dining. C’mon, spring! 272 Boylston St., Back Bay, Boston, 617-426-7878, bistrodumidi.com. Copyright ©2019 Boston Magazine unless otherwise noted.